Hairdo How-to: Add Some Color! A (mostly girls' hairstyles) blog created for those who want to learn how to style hair at home, from beginner basics to fancy schmancy. This year, color streaks have been the fad. 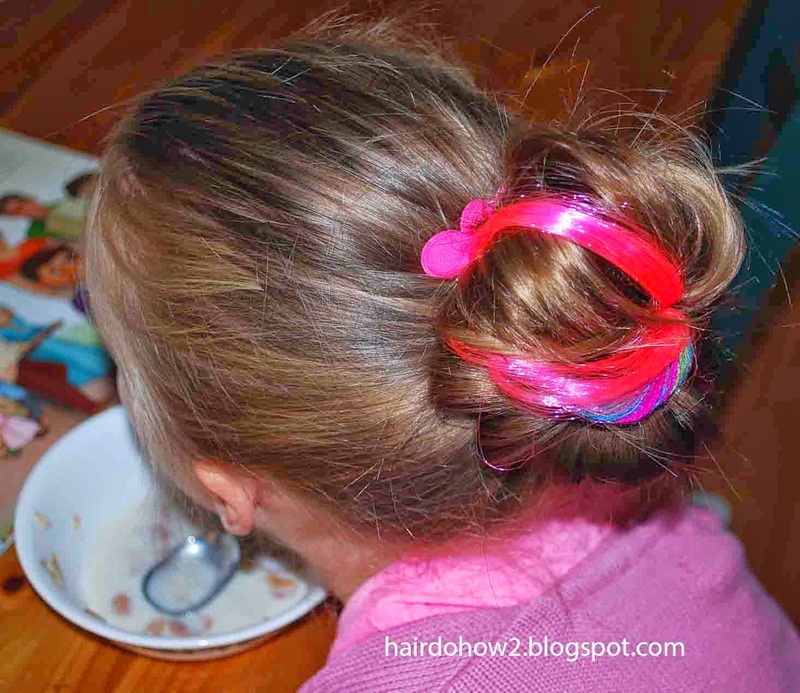 Girls at school are actually wearing bright colors in their hair, even in kindergarten. There are several ways to get the color. 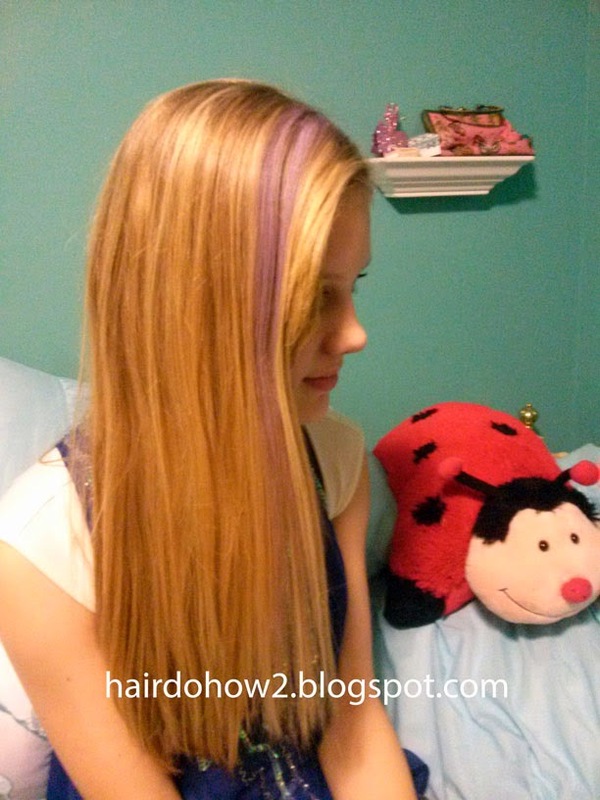 You can dye it permanently, add a temporary dye like chalk, or put in an extension. Here's my lovely niece with a chalk streak from Gimme Clips. Instruction are on the package, but they include getting the hair damp and using a heat tool to set the color. Here is an extension clip I got from Kohl's. It has a snap clip at the top, colored hair, and colored yarn. To add some color to a sock bun, just clip the extension at the top of a pony tail, and roll it into the sock. 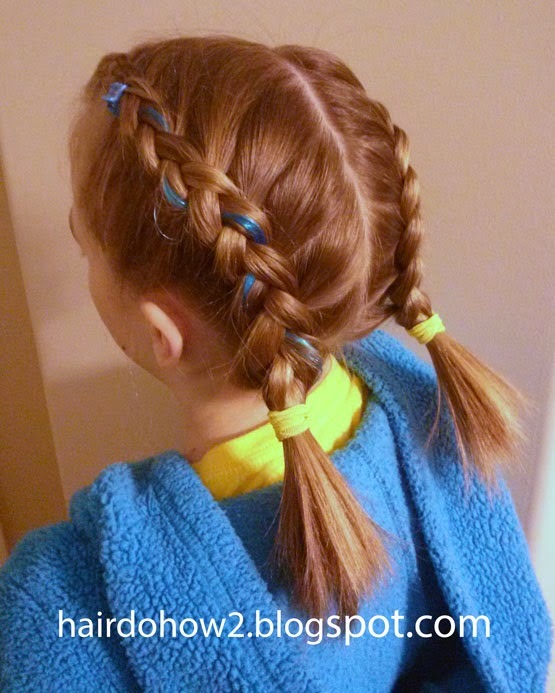 For this style, the hair is parted on each side and then dutch braided. Belle is growing out her bangs, so I started with a regular dutch braid and then added this hair extension with the mini jaw clip from Gimme Clips at the place where her bangs started to stick out, then continued braiding with the color in one strand. I tried to keep the color bit at the top, but it wanted to sink in anyway with every plait, so after I fastened it off with the hair band, I went back and pulled up on the color at every twist to make it show. When you use hair extensions, you have to take special care of them. They shouldn't be thrown in the drawer or box with the other hair stuff or they will become a tangled mess, and possibly fall apart if you try to comb them out. Be gentle when taking them out of hairstyles and put them away in their own separate place, such as in a box or hanging on a bow keeper. Must say that this is quite an inspirational and much fascinating blog when it comes to kids hairstyle pop into nowhere else then this website since it has some of the dashing hair style to display, I've been working at an salon in Oceanside and will surely try and persuade a few of my clients kids. Everything you do is great,but could you please,PLEASE continue the Barbie tutorials?They are all so pretty,and the ones you have done so far came out amazing! 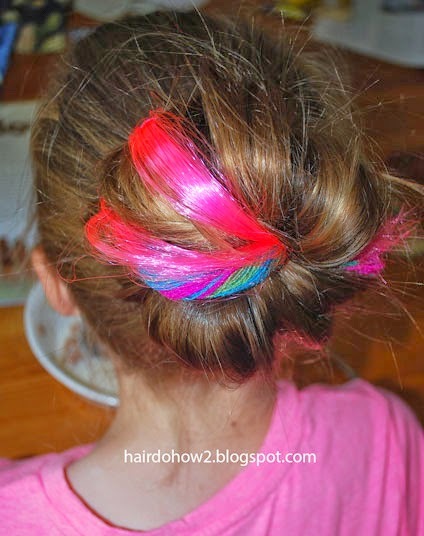 its an amazing to see the colors scheme in girls hairstyles. the 2nd image give the amazing look for the girls hairstyle. Join us on Facebook and Pinterest! Your comments are my fuel! Please tell me what you think. It makes me happy. I'm a stay-at-home mom. Beautiful Belle is my daughter, and Sweetheart is my son. I belong to the Church of Jesus Christ of Latter Day Saints (otherwise known as Mormons). I love many kinds of creative arts. I play the violin and sing. I also enjoy writing and teaching. Utah is my home. THANK YOU to our sponsors! Let them know we sent you. Copyright 2010-2012. Don't copy my pictures! Share my words, but don't take credit. Ethereal theme. Powered by Blogger.